Our SupportPro team offers equipment training courses at our Headquarters, centrally located in Riverside, Missouri, USA. Through a combination of classroom training and hands-on experience, machine operators, maintenance technicians, supervisors and other key personnel will receive four full days of in-depth training. From preventive maintenance and regularly monitoring the performance of equipment to system updates and refresher training, we'll ensure your staff is well-trained to avoid costly downtime and maximize ROI. 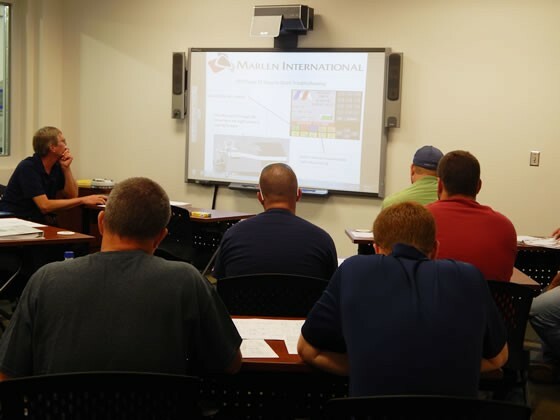 We currently offer two courses focused on the Fundamentals of Marlen’s OPTI series vacuum pumps and an Advanced Course designed for experience maintenance technicians, plant engineers and supervisors. Course outlines, schedules, associated costs and accommodations are included in our Course Outline. To register, please email our customer care coordinator, Brad Willsey at brad.willsey@marlen.com or call 913-895-1262. Our In-Plant Training Program is designed to optimize equipment reliability for maximum uptime of your Marlen, Carruthers, Afoheat or Unitherm equipment. In addition to training plant personnel, our “Marlen Certified” optimization expert will perform deep diagnostics of your equipment utilizing our 1000-point audit process and will also conduct a full evaluation of your parts stocking procedures. To register, please email our customer service coordinator, Brad Willsey at brad.willsey@marlen.com or call 913-895-1262.